Ahh, Fall is here, and with it comes a flurry of activity on projects we have been procrastinating on due to the summer heat. First on the list for me is canning. It's not very fun to be canning in a 90+ degree kitchen, so I usually only can what I must during the summer - produce from the garden or a sale at the grocery store that I can't pass up. But for most of the summer, we use our pantry of foods I had canned during the fall, winter and spring for quick meals that do not add a lot of extra heat to the kitchen. So, come September, our pantry shelves have a lot of empty canning jars that need to be re-filled. A local grocery store had a sale on ground beef in 10 pounds packages, as well as beef roasts. Another store had a '10 for $10 sale' where I picked up pears (10 pounds for $10) as well as chorizo (10 packages for $10). I had picked up a large supply of used canning jars off of Craig's List this summer and they were all cleaned and waiting to be used. It was now much cooler in the house during the day and I was in a canning mood. The one issue I have with canning when there are sales on meat is that, with no freezer, once I buy anything in bulk to can I really can't stop until everything is in the jars. I can space the canning projects out over a few days as long as I have space in our fridge (remember it is a small chest freezer converted to be able to sustain refrigerator temperatures). sure they will fit into the jars. I usually try to get creative and multi-task when canning, especially when I have a lot of odds and ends which in themselves will not produce a canner full of jars. I hate wasting propane by having a batch to can that only uses half the space in the pressure canner. For example, after a canner full of hamburger stew (7 quarts) and other jars loaded with chili and one more of meatloaf patties (one of our favorites by the way), I had several smaller amounts of various meats that I mixed and matched into a full canner load. I had two beef roasts, some ground beef left over from my other items listed above, three packages of polish sausage, some chorizo sausage and some chicken I had pulled off the bone when I made bone broth a few days ago. First I fried the remaining ground beef and chorizo (Mexican sausage), then cubed and browned the beef roasts and sliced the polish sausage into chunks that would fit into wide mouth pint jars. Since everything was going into one canner load, I wanted to have everything prepped so that all the jars could be filled as quickly as possible to keep everything hot. Sorry, I didn't think to take a picture of all my various prepped pans of meat sitting around the kitchen - next time. While my pressure canner holds 7 quarts, I can fit 20 pints in it because I can double stack them. I prefer to can most of our meats in pints because that is enough for a meal for Alan and I. I use quarts for soups and stews and other ready made meals. So, I started filling various types of canning jars with my plethora of meats - 6 pints of cubed beef, 6 pints of ground beef and three wide mouth pints of polish sausage - it's easier to fit the sausage link segments into the wide mouth jars. That leaves the left-over chicken and the chorizo. Remember, the chicken was from making bone broth, so it was already well-cooked, as it had already simmered for three hours. I try to be a little creative when canning this left-over chicken. One batch of bone broth yields enough chicken for 2 or three pints and since it had simmers so long already and then will be in the canner for 75 minutes, it is relegated to soup use. This time, I filled my pints about 3/4 full of chicken and then topped it off with some of my waiting chorizo. I can't wait to open these up this fall and winter and concoct some sort of chicken-chorizo soup and/or stew. The rest of the chorizo went into half-pint jars. A little bit of chorizo goes along way, and we love scrambled eggs and chorizo in flour tortillas. This last batch of meaty goodness was completed in half a day start to finish including the prep work. Next came the pears. I always say I prefer canning meats and meals over fruit or vegetables, because the prep work is always much faster then preparing a batch of fruit or vegetables for the canner. I decided to put my pears in wide mouth pints. The pints were better for a serving size for the two of us, and the wide mouth pints would be easier to fill with larger chunks of pears. I can cut them smaller when I open the jars if I want, but the larger pieces would stand up better to the canning heat. Pears, as with all fruits, are water bath canned rather than pressure canned. They do not require the higher temperatures achieved through pressure canning, and the lower temp of water bath canning preserves the integrity of the fruit. However, you do have to submerge the jars completely under boiling water, which requires a lot more water then pressure canning - one of the reasons I don't like to water bath as much as I like to pressure can. While my meat prepping of the previous day took very little time, I knew the pears would take much longer. First I wanted to estimate how many jars I would actually be using. I placeed my jars inside the pot I was using as a water bath canner to see how many would fit (8 - no double stacking in a water bath canner). I then prepared my 'holding water' - a half gallon of water (yes, sigh, using more water) and three crushed vitamin C tablets to keep the pears from browning while I was peeling and cutting them all. 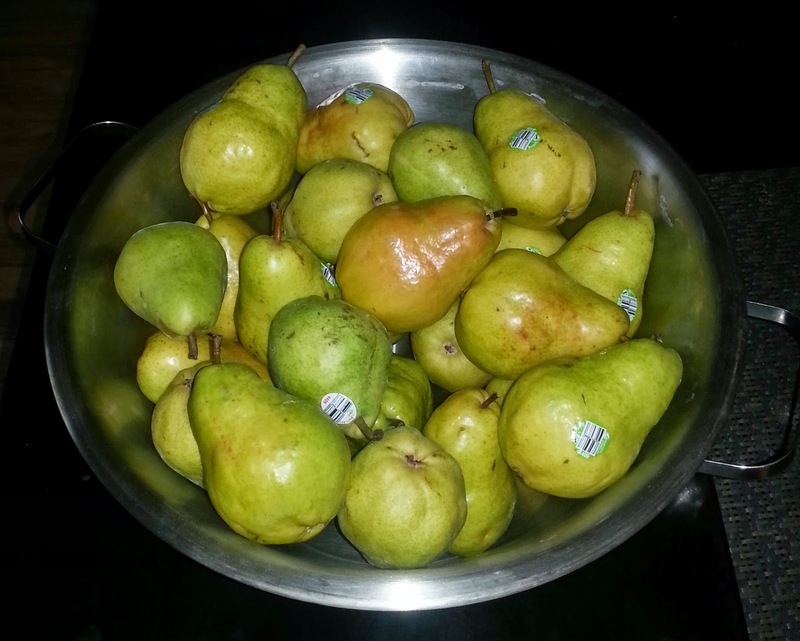 Next I prepared 2 pears to see how much would fit in one of the jars (about 1 1/3 pears). Now come the math - 1 1/3 pears times 8 jars equals 10 2/3 pears per canner batch. I had 26 pears, so I had 2 batches worth, with a few pears leftover for snacking. I quartered, peeled and cored my pears. I cut each quarter in half to form largish chunks. I then made a very light sugar syrup to pack the pears in. After all the prep work, the actual canning went fairly quickly. When all the jars were filled and in the boiling water, I decided to prepare another batch since I already had the water up to boiling and all my canning paraphernalia was strewn about the kitchen. So, I raced my canner - I had 20 minutes to prep another 8 jars of pears. So, that days canning yielded 16 jars of pears. That doesn't seem as productive as the previous day of meat-a-rama, but I am sure we will enjoy the pears this winter. A couple of weeks ago, we had someone pull into our driveway. Believe it or not, that is big news around here - a very rare event. Even more astounding, it was someone we did not know. We occasionally have friends make the trek out to our place, but we usually meet them closer into town, or at their homes so they avoid the wear and tear our road puts on their cars. Anyway, this visitor gets our of his pick-up truck and asks if we have seen a lost dog. It turns out he is a 'neighbor' that lives a couple of roads away from us and one of his dogs did not come home after a run in the woods. As we were talking, he saw our solar panels and got excited. He told us he installed solar system for a living. In fact, he said when his company received panels that had been damaged during shipping, the shipping facilities paid for replacements and his company allowed him to take home the damages ones. He went on to offer two such damaged panels to us for free. He said they would not provide full power, but the would work. A couple of days later we made the trip to his house, picked up the panels (minus one very large black widow spider that had made one her home) and left a sample of my various canning sessions as a thank you. I would have baked a batch of chocolate chip cookies to take, but it was way too hot that day. We were fairly certain that even without working at full capacity, adding these panels to our array would be too much power for our charge controller to handle. 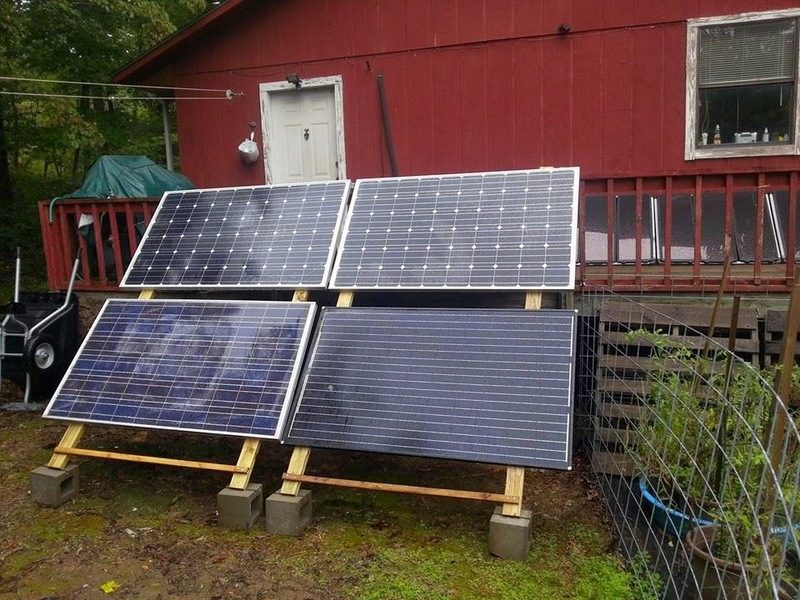 When we got home, we unloaded them from the truck and then discussed how we were going to modify our mounting frames that were currently holding our two Grape solar panels so that we could add in these two new panels. We decided to once again make an upgrade to our previously upgraded frame... you may recall we often have upgrades to better versions of many things around the property as we get new ideas, learn of new products, or have more cash available. In this case, Alan decided to build a larger, sturdier frame that would accommodate all the panels and still be able to be adjusted to the correct angle for our winter and summer sun angles. Once built, we installed one of the new panels and cabled it into the system. The Tracer charge controller that we had been using for the existing Grape panels' feed into the batteries immediately displayed it was in overload condition, and it shut down. Before our 'wind-fall' panels, we had pretty much decided that sometime, when we had funds available, we were going to upgrade to a new charge controller (version #3) and add in two more Grape panels to complete our system. We had plenty of power with just the two Grape panels and our array of Harbor Freight panels that we had started with, but the additional wattage would give us peace of mind for our solar fridge when we have several overcast days in a row, as well as allow us to run some other appliances, like a food dehydrator from time to time. With the free panels, which would cost about $600 new, we decided to go ahead and purchase the new charge controller so that we could start making use of them. We placed the order and impatiently waited for it to arrive. In the mean time, Alan downloaded the user manual and got more and more excited as he read each page. This is a super-duper, highly technical controller compared to our previous models. When it arrived, Alan was watching a DVD of how-to videos that had come with it. As was listening along while I was canning, at one point the manufacturer was listing a multitude of statistics that that are stored on the unit. I commented that it sounded like a good opportunity to set up a spreadsheet (my gardening spreadsheet will soon be going dormant for the winter and I know I will be itching to start organizing statistics on something else). Well, not even three minutes later, the narrator on the video give instructions on how to download an Excel file (spreadsheet) of all the data, oh well they already thought of it and had all the fun of creating it themselves. Maybe I need to come up with a list of stats to track on my worm farm instead. 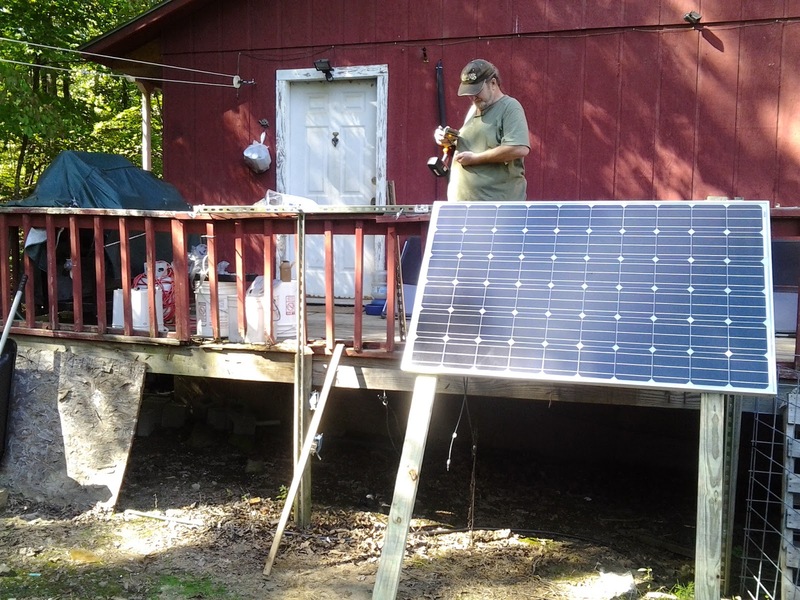 Here is where we stood: we had just purchased a new charge controller so we could use our new 'free' solar panels, which in turn slightly decreased our power input. But now that we spent all the money on the new charge controller what should we do? It so happens we have a friend with a Grape panel that he has not yet installed. We asked if he would be willing to sell it to us. He agreed, so we removed the damaged panels and gave them to another friend who wanted to 'play around' with setting up a small back-up system for his camper. We then added the new Grape panel to our system. 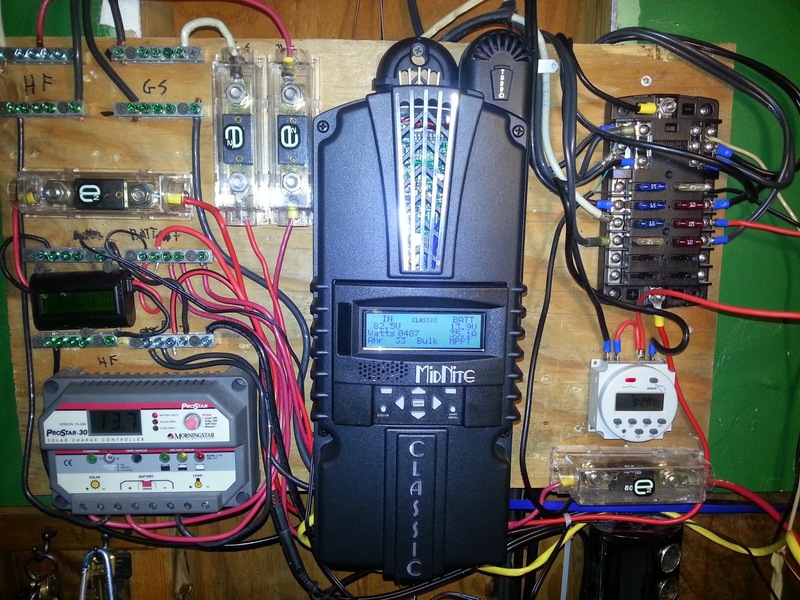 So, our two 'free' panels led to the purchase of a new charge controller and a new solar panel. We decided we can stop here, for now, but we do want to add in one more panel in the future since our new frames were designed for 4 panels and we selected the new charge controller because it could handle four fully operational panels. Are we disappointed we accepted the offer of those two damaged panels? We both agree we are not. As I said, we were almost 100% certain were were going to make these upgrades sometime in the near future and those panels just provided the slight nudge to have us get this upgrade in the works now. With the bounty of the garden this summer, I have also been busy dehydrating. Our solar dehydrator is not built yet, but the oven on our stove can be used as a dehydrator with the pilot light providing the heat. You may recall that Alan claims to be chlorophyll intolerant, and so our bounty of vegetables does not excite him. However, while he does not eat stand alone vegetables, he will eat them when they are in soups and stews and do not 'crunch'. One of my goals with dehydrating was to create vegetable powders that I could incorporate into many of our other foods (aka stealth vegetables). Dried but not yet crispy. After drying all of our tomatoes in the oven, I purchased a small food processor to process them into powder. Attempt #1 was not a success. The dried tomatoes gummed up in the bottom of the processor, and at best became smaller pieces, but no powder. All of my dried tomato slices were still leathery after being in the oven for several days, and everything I read said they needed to be dried until crispy to process them into powder. I came to the conclusion that humidity was trapped in the oven during the drying process, and thus I could not achieve crispy tomato pieces. With our power capacity growing, I decided to purchase a food dehydrator to see if that would produce a drier end product. The food dehydrator is a power hog by our standards, so my plan was to continue using the oven, since that heat source is always available, and then finish them off in the dehydrator. My first batch of tomato powder. I loaded up the 'dried' tomatoes into the dehydrator and a few hours later I had crispy slices - this looked promising. I also had a friend who told me he added a small amount of cornstarch to his dried tomatoes as he processed them into powder. I once again placed some of the tomatoes into the food processor and sprinkled on a little corn starch. Once again I was disappointed with the results, the results were better, but not what would be considered powder. I had one more thought. I had just been putting a small amount into the bowl of the processor each time, this time I loaded it up and that made the difference. I then processed onions in the same manner. Next will be carrots and celery. Last winter was much colder than what has been the norm in the past, and this winter is supposed to be even colder yet. Since we did end up with frozen waters lines last year, Alan has been pondering various solutions and has created an alternative water source we can use should our outside water lines freeze at some point this winter. This summer we had installed a 55 gallon drum in the utility room and plumbed it into the utility sink to be an extra water source we can use should the outside lines freeze. However, if the line for our gravity feed to the bathroom freezes, we would still need to carry water from the utility room to the bathroom. This week Alan added a water line between the utility room and the bathroom. Our new water line which goes through our two guest rooms happens to be a garden hose. At the start of a project, Alan will always ask me how important certain aesthetics may be to me - like having a garden hose running through the house (anchored to the baseboard). We like to come up with easy solutions whenever possible, and oft times, this results in using materials outside the norm. I told him I had no problem at all with this idea. So, with a few more valves and some holes drilled through the walls we have a second source of running water to the bathroom. (4) the Isuzu Trooper (Stormy). We took Stormy in for repairs a couple weeks ago for a power steering leak, and an oil leakage problem, and also a sporadic lack of power when he is under a load such as climbing hills. The leaks are fixed, but he is still at the mechanic as the loss of power issue has not yet been resolved. Meanwhile, we went to loan Hoss to a friend and discovered he had a broken brake line. We took him into a more local mechanic for his repairs. We were then going into town with Rodney and discovered (on the first downhill portion of the trip) that he also had very little braking ability. We took him to the yet another mechanic we have used which is on the first paved road we hit when leaving our place. So three of our vehicles - Stormy, Rodney and Hoss were all in the shop, or I should say three shops, being worked on at the same time, and two of them were break issues. That leaves us with Truck as our only vehicle and the funny thing is, before all this happened, we were discussing that we have to get Truck into the shop because his brakes are getting a bit soft. Now I know some of you are probably thinking you guys are supposed to be self reliant and fixing these vehicles yourself. But, as with several other things we have found down here, mechanics fees are much lower than up north and as long as the funds are available, it is not worth the hassle to do it yourself when there are other projects waiting on the list to be completed. Especially when you don't have a hard flat surface to work on, jacking up a truck on a sloping gravel surface is a dangerous idea. Speaking of projects lists, we really can't stop working at crossing items off our list right now because two of our grandsons will be visiting for a week soon, and I am sure they will be keeping us so busy there will be no time to stop and get anything else done while they are here. And that's a good thing! NOTE: The grandsons have come and gone and we had a wonderful time. I had this blog written before they arrived but had a few more photos I needed to take before publishing it. We were so busy having fun with the boys I did not take the pictures until after they had left. You may need to be of-a-certain-age to appreciate the title of this blog entry. Years ago, you had about 3 television channels to choose from - four if you considered PBS a viable channel because you liked to watch the artist with the funny hair as he painted landscapes ("Now there's a happy little tree") or the lady with the funny voice who cooked French food ("With enough butter, anything is good"). And, even worse, you were relegated to watching re-runs all summer long. All the major networks - yep, all three of them - would have a hiatus of prime-time programming during the summer and would re-air (television came to your house over the air waves) all the episodes that had premiered during the past fall and winter. What does all this have to do with our recent adventures? This spring, as I was looking at our schedule of upcoming events, I realized we would be repeating many of the events of the previous spring and summer. Thus, we would be experiencing re-runs from the past year. Some of these re-runs were chronicled in my last blog entry: Strategically timing the planting of the garden to work around our scheduled absences from the property, a trip to Wisconsin in May for the birth of a grandbaby and worrying if the garden had survived during our travels were all repeats from the previous year. Since my last entry, we have seen several more re-runs. First was our annual trip to BreyerFest to help our daughter with her sales event. Our daughter does a wonderful job with her home-based business and each year this three day event nets a large portion of her annual income. 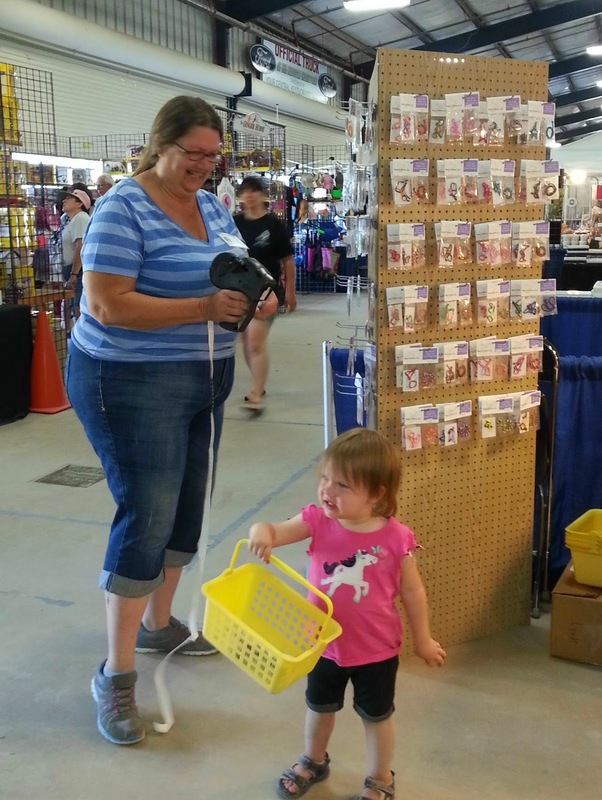 Last year, Alan and I had met our daughter and her family in Kentucky - she and her husband drove from Wisconsin with all the product, booth supplies and a not-quite-one-year-old-daughter while Alan and I drove straight from the Ozarks. 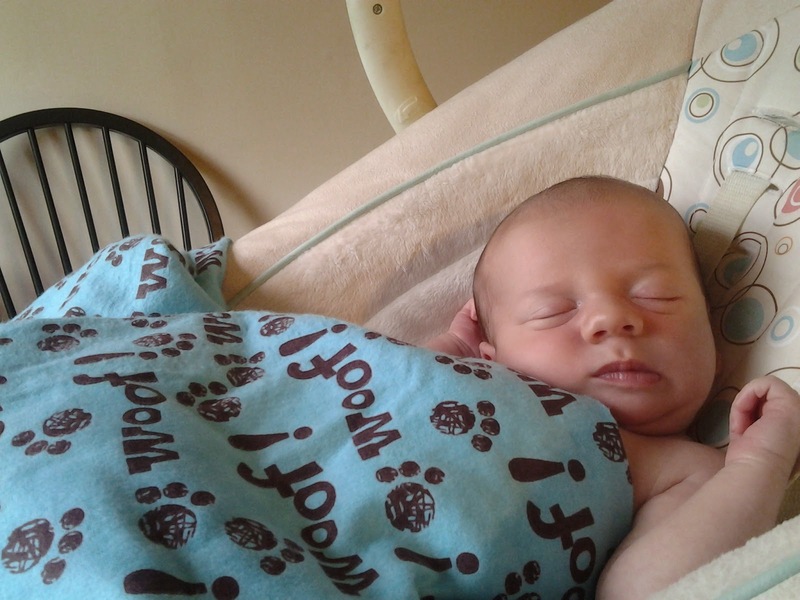 This year, since she had given us grandbaby number four about a month before the sale, we decided we would drive to Wisconsin a few days before the event to help with packaging product and any other preparations that the arrival of a new baby may have disrupted. There was a great benefit to taking this round-about route to Kentucky - we got to have the now-almost-two-year-old ride with us from Wisconsin to the Kentucky Horse Park. She was a great little traveler and so much fun! deck chair with one of our cats. A series of reruns that have been progressing throughout the warm spring and summer have not all been enjoyable. Unfortunately we can not get up and turn the channel (dating myself again) to avoid the not so nice episodes of these reruns. I am referring to our various phases of insects throughout the summer. Some are quite enjoyable, such as the walking sticks, dragonflies and even the very noisy katydids which we actually love to hear at night at their glorious 82 decibels. However, there are others we wish would be canceled all-together. At the top of the list of insects we wish had been cancelled before they even aired (or crawled) are chiggers. The chigger population seems much worse this year, I guess they have made it into syndication, or maybe it is just because I am spending more time in the garden that I seem to be getting attacked by them more often. It actually took me a long time to figure out what sort of insect was biting me so repeatedly. I was waking up nearly every morning with several nasty, itchy bites and was starting to worry it was something in the house. An insect expert had once told a class I was in about house mosquitoes, which he said were much smaller than they typical mosquito and often got underneath blankets to bite people at night. I was skeptical of this explanation and once again started googling to see what I could find. That is when I discovered what chiggers are. Chiggers can not be seen by the naked eye, they are prevalent in grassy and wooded areas and, if they get on you, they tend to gravitate toward waistbands and other areas of restricted clothing. I also learned that they can wander around, unseen, on your body for several hours before biting - thus the reason I was finding new bites in the mornings. One preventative action is to shower off immediately after coming in from outside. Our water supplies have been in good shape this summer so I have been able to put this practice to use and it has helped. I also found a couple products to help alleviate the itching aftermath of bites. There is a commercial product called ChiggerX which can be applied topically. Salt is also a helpful balm, it can be added to Vick's VapoRub (which holds the salt in place) and then applied to the bite area. We have also found the crystal salt deodorants are a great way of applying salt to the bite. Enough about insects, now I feel all creepy-crawly. So, on to arachnids which are also having a re-appearance this August. 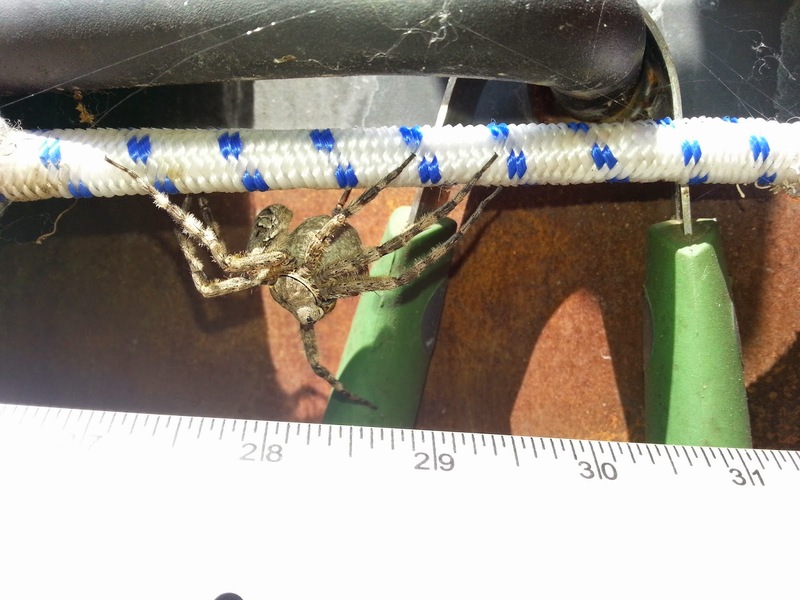 A few weeks ago I spotted a very large spider on our grill. I knew it was a wolf spider, which I had read was somewhat dangerous, so we quickly dispatched it. I commented about it on Facebook, and someone said that wolf spiders are actually beneficial. So, back to more googling. Though the first arachnid site I had read said wolf spiders bites are poisonous, but not as`dangerous as the brown recluse, I soon found another site that stated that the North American Wolf Spiders are not dangerous. It just proves that you never know what to believe on the internet. on our window eating moths. Several days later we saw another wolf spider on the outside of one of our window screens. Since I was now more inclined to think that wolf spiders are beneficial, and she was not attempting to get into the house, I decided to leave her alone. Virginia (Wolf) stayed on the screen for several days and then moved to the wood siding of the house. Once we lost track of her whereabouts outside, I was a bit apprehensive, but since we had named her she is now a part of the family and thus a friend and not a foe, at least in my mind. baby spiders, so I found this one on the internet. Soon after that, I was walking along the front of the house, heading to the north garden, and saw a fine web between the deck railings. Our deck is about 5 feet off the ground at the front of the house so the web was just about eye-level. There were three half-dollar sized orbs held within the web. Although I had read that wolf spiders carried their eggs and babies on their bodies, I assumed these were spider eggs sacks and did not want hundreds of spiders hatching onto our deck. I called to Alan, who brought out the spider spray. He was on the deck and sprayed the first orb while I was watching from ground level. As soon as the spray hit the orb, what had appeared to be an egg sac spread out into dozens upon dozens of baby spider to about a four inch radius within the web before they died. The orbs were actually masses of spider babies that had already hatched. While I felt bad about the mass spider-cide, I could not bring myself to let the other two masses of baby spiders alone knowing they would be spreading out all around the outside of the house. 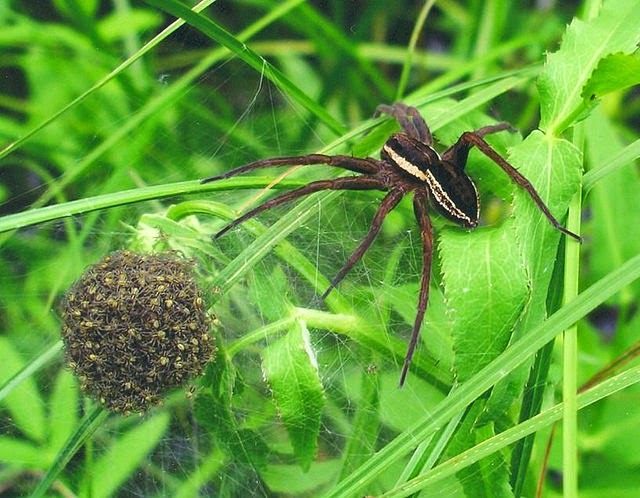 Back to Google one more time and I have concluded that Virginia, whom we have not seen since the eradication of the orbs, is actually a nursery web spider. These are often mis-identified as a wolf spider. Nursery web spiders are not poisonous. 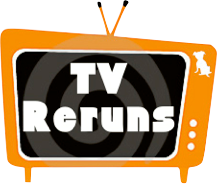 Lets see, back to the topic of re-runs. Wikipedia actually categorizes several types of reruns. There were the Television Specials which were classics that usually aired annually, such as the Wizard of Oz and and a version of Cinderella that I remember watching as a child. Before the era of the VCR, these special programming events allowed people to view various classics annually. I would put the arrival of another grandbaby and the enjoyment we get out of the annual Kentucky trip to help our daughter into this category of reruns. Another type of rerun, according to Wikipedia, is the During Hiatus episodes. These are the types of television shows I described at the top of this article, where a prime-time series would run their new season from fall through spring and then show repeats of that just-viewed series during the summer. Thus, the reruns started up immediately after that year's series of new episodes had finished airing. At our house this year, I am attempting a hiatus-run in our garden. I have been harvesting various crops throughout June and July and some of the raised beds had been fully gleaned by August. With first frosts usually not occurring until late October in our area, I wanted to see if I could plant a re-run of various crops in early August in hopes of having a second harvest in October. I cleaned out 5 raised beds that had completed their growing cycle and planted a new batch of crops I hope will mature quickly enough. So far they are all making a quick start except for the carrots which appear to be slow germinaters wherever I plant them. This post is getting rather long, so I am not going to go into a lot of gardening details. I plan on writing a detailed garden post at the end of the season. on our kitchen table this summer. And then there are the Syndication reruns. If you are of my generation, think of The Brady Bunch or Munsters shows you would watch over and over again on weekday afternoons after getting home from school. Syndicated shows are often aired over and over to fill non-prime-time scheduling blocks. These are the soy (cheap fillers) of the television industry. They can be fun for a while, but often become boring and monotonous after viewing the same episodes over and over. So, what are some of our syndicated re-runs? The first that comes to mind for this summer is picking and shelling cowpeas (aka black-eyed peas). While I have been picking the prolific legumes almost every day since mid June, I am still in the 'fun for a while' camp of this oft-repeated event. tomatoes and, of course, cowpeas. Almost every morning I go out to the gardens to water and since mid-June that trip has included taking along a bowl to hold whatever is ready to be harvested that day. There is usually a variety of produce that can include tomatoes, onions, carrots, squash, pole beans, cayenne peppers, etc. But, no matter what the combination is on any given day, there are always cowpeas. You can pick and prepare fresh, green-podded cowpeas, but I prefer allowing them to dry on the vine and then shelling them and storing them as dried black-eyed peas. I could just wait until they all dried on the plants and then harvest them all at once, but I really enjoy harvesting our bounty out of the garden and this way I can shell them over time rather then sitting down at the end of the season with huge piles of peas and beans that need to be processed. Watering the gardens is another syndicated event. I do this everyday after picking whatever produce is ready for the harvest. We have had a lot of rain this summer and Alan has constructed a pressurized water collecting system that is dedicated to watering the north garden, which is our largest and is farthest from the house. The repetitive watering is not as enjoyable as the harvesting, but that is because the amount of time I spend out in the gardens is proportionate to the amount of itching I will have from chigger and mosquito bites afterwards. I am ending this blog with one more event we had this summer that I hope will become an annual re-run. As we were driving home from Kentucky, we met up with friends in Branson. Alan and I have been to Branson several times, but we do not go there for the shows, other than the show that started it all - Shepherd of the Hills. 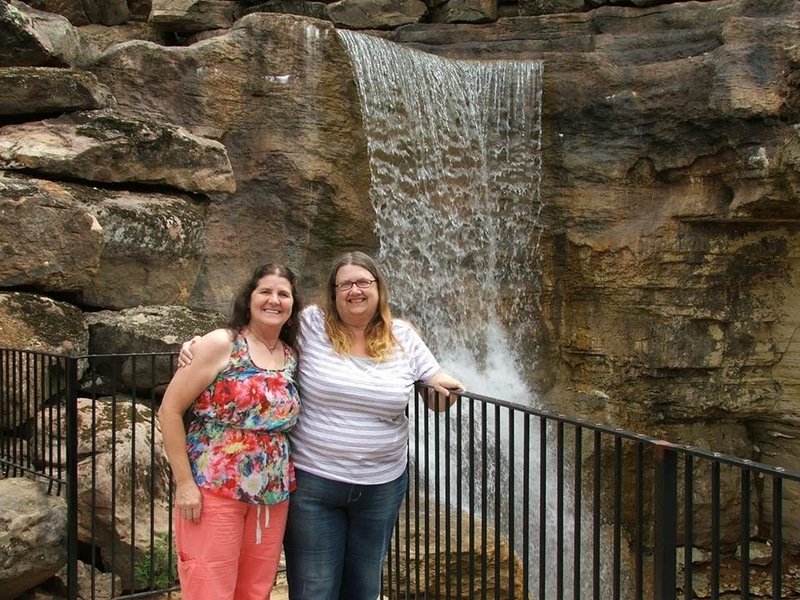 Our friends have also been to Branson several times and we had fun showing each other our favorite haunts as well as exploring new activities together. We saw several shows that were quite good. Alan and I particularly like 'Six' and 'It', both are singing family groups and very entertaining. Our friends have a 'mad money' jar in which they collect change all year and they cashed it in to help fund their trip to Branson. 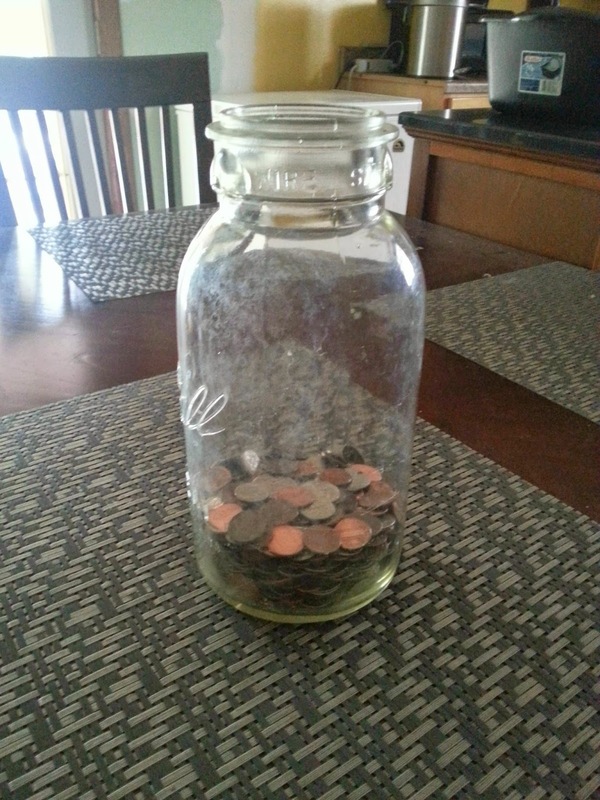 On our return home, I re-purposed one of my large, half-gallon canning jars to be our own mad money jar. Hopefully it will be a part of us being able to enjoy a rerun of this enjoyable outing with very special friends. What's the Scoop? Give Me the Dirt! It seems that our life each May is getting a bit redundant. Last year our May consisted of - rushing to plant the garden - heading home to Wisconsin for the birth of a new grandbaby - returning south about a month later to see how the garden had fared in our absence. This May we have again rushed to plant the garden, are now back home in Wisconsin for the birth of another grandbaby and then will be returning in a month or so to see how the garden has survived. We have a had a new grandbaby each year for the past four years, I am hoping my garden will be as fruitful! Actually, I should say gardens, as we now have three garden areas. The east garden is the original raised garden area along the road in front of the house where the previous owners had planted flower bulbs. Last year I spent days digging up flower bulbs that had multiplied over the years. This garden was not very successful last year as the dirt that was used to build it was very rocky and mainly clay. This year, I left the asparagus and rhubarb in place that I had planted there, but the only other item I planted in that dirt were Jerusalem artichokes. These root vegetables, which are also known as sunchokes, are supposed to grow almost anywhere and are perennials (like the asparagus and strawberries in that same bed). They are used like potatoes. According to my garden spreadsheet, I planted the Jerusalem artichokes on March 23rd and when we left the property on May 10th, there were already 2 feet high. They look like sunflowers as they grow and the edible tubers have a knobby appearance similar to ginger. Hauling tires onto the property! I also placed some tires in this bed to use as containers. We were told that before we purchased this property, the bank that had foreclosed on it had hired a service to clean up the house and grounds. This clean-up included removing 79 tires from the yard and woods around the house. When I told Alan I now wanted to move some tires back onto the property for gardening, he was not enthusiastic. But, when I promised to paint them to look less tire-y he agreed that I could use them. I even found someone on Craig's List giving away dozens of tires that had already been modified for gardening - they had removed one side of the tires. So, off we went to collect a couple dozen tires and several cans of spray paint. Four of my colorful tires are now in the east garden and are being used for Long Island Cheese Pumpkins. Next came the south garden. I had started this area, next to the house, as a container garden last year and have expanded it this year. We placed feedlot panels around the garden area to keep out deer and then added more containers. This garden now has lots of large flower pots for tomatoes, as well as more colorful tires and some kiddie wading pools I got on clearance last fall and am using as raised beds. As soon as it was done I transplanted my tomato plants and peas from their starter pots into their containers. The next morning, when I checked my little plants, I discovered something had climbed through the feedlot panels and dug up several of each of vegetables I had planted. Whatever critter it was, it had not eaten the plants, so I was able to rescue most of them and replant them. Time to start googling... Alan found a product we could sprinkle around the perimeter of the garden (not near the actual plants) that was supposed to repell all sorts of animals. The label indicated this included raccoons, opossums and armadillos which were all high on our list of suspects. This product had mixed reviews on its effectiveness, so we were a bit dubious, but it was worth a try. The next morning I rushed out to inspect the gardens and everything was untouched. No critters have crossed the barriers in over a week, so hopefully we have found a solution to our nocturnal invaders. A stack of the collapsible raised beds. prongs on the bottom for stacking. The majority of our efforts have gone into creating a brand new garden to the north of the house that is now our largest garden area. We were able to purchase some very nice, inexpensive, collapsible raised beds that can also be stacked to make deeper beds. We chose the location for the new garden because it is flat and is the only area that is able to get sun most of the day. The first step was to lay down landscaping fabric. Next, we placed the raised beds and then it was time to bring in the dirt. We found a business that sold mulch and top soil by the skid-loader scoop full, four scoops fills the bed of our large dually pick-up truck. We discovered this place also sold what they called 'raised bed mix' which is equal parts of top soil, sand, mushroom compost and fine pine mulch. This combination produces a loose soil with good water retention. Our first truck load filled all my new containers and four of our double stacked raised beds. A truck load of dirt does not go as far as you would think! FYI - it takes 75 shovel fulls to adequately fill a double high raised bed. They could use some more dirt in them, but that will be added this fall or next spring. The North Garden - almost completed. We knew we would need another two loads at least to complete all the beds, but with time running short, we were leaving in 4 days, we opted for one more truck load for now and then will fill the rest of the beds later in the year. So over two days, we had shoveled two truck loads of dirt into 5 gallon buckets, carried them to the beds and dumped, talk about sore muscles - especially since we have not been carrying firewood into the house for a month or so. Oh, and by the way, it was 90 degrees the week we were creating the north garden. 3. I did not want to plant anything too early, to avoid any produce being ready to harvest while we were gone. 2. There was a big rainstorm predicted for Thursday night, so if we finished filling the beds with dirt before then, they would get thoroughly soaked and I could plant all my seedlings on Friday (plans were to drive home on Sunday). So we finished off the dirt Thursday morning, completed the cattle penning around the new garden and waited for the rain. We did get our rain, so early Friday morning I started carrying all of my bedding plants to the north garden to be transplanted. It worked out that we had been able to fill just enough beds to accommodate all my waiting plants. Adding twine climbers for my peas. The final step was to add the various supports and trellises for the climbing plants and then a prayer that everything will survive during our hiatus. Actually, since I have a black thumb and can't even keep cactus alive, it is probably a good thing I am not around as all of our plants take root. 3.) what the results are for each variety. I will use these records to make changes next year to hopefully improve upon our results. Here is a list of the columns on my spreadsheet: SEED TYPE, DAYS TO GERMINATE, GERMINATION RATE, DAYS TO MATURATION, INSIDE PLANTING DATE, OUTSIDE PLANTING/TRANSPLANT DATE, LOCATION, DEPTH, SPACING, SUPPORT TYPE and YIELD. There is probably one more column I should add: DATE ALAN EATS THIS as he claims to be chlorophyll intolerant and thus does not eat vegetables.... yet. I was originally going to write this first-of-the-year blog entry as a countdown of the things I do not like about living off-grid. But after sitting looking at a blank list, I realized there is nothing I do not like about my new lifestyle, there are just some things I like less than others. Even these 'drawbacks' have merits in their own way. 1. No Ice Cream! Our solar system provides us with a fairly abundant power supply, in fact, we recently upgraded to a larger refrigerator that is a converted chest freezer that is powered by our bank of solar charged batteries. We originally set up our kitchen with a small propane powered refrigerator. When shopping for the propane fridge, we could have opted for a 'typical' fridge design that even included a freezer, but one of these models would go through much, much more propane than the model we chose to meet our needs. Once we realized the potential of our solar system, we decided to break one more dependency - that of buying propane for refrigeration, and switch to a solar electric option. However, with both of these refrigerators, neither has a freezer compartment. Well actually, the propane fridge was less accurate when it came to temperature control and we did at times end up with frozen milk and other items during hot weather! THE MERIT of no ice cream in the house - There are actually two; first I tend to keep a supply of yogurt in the fridge and have that as a snack at night instead of ice cream and, second, stopping for ice cream while out running errands is a big treat. Oh, one more possible merit, we were at a birthday party a couple weeks ago and I did not feel guilty having a second helping of ice cream at the celebration. This is NOT the spider I found, nor is it my hand! 2. Poisonous Spiders. Technically, this is not an off-grid issue, and as I think of other items I plan to include on this list some of them are not off-grid-centric but are more apparent and/or prevalent due to (a) moving south and (b) living out in the woods. Besides the brown recluse bite I had a few months ago, I also saw my first black widow spider a couple weeks ago. I was bringing in wood and one of the logs had a small black spider on it. Fortunately said arachnid was deceased, but I noticed a small bit of bright red on it, and upon closer examination I saw the tell tale red hour-glass shape on the abdomen. There were also red spots on the top side of the body, which I was not familiar with. 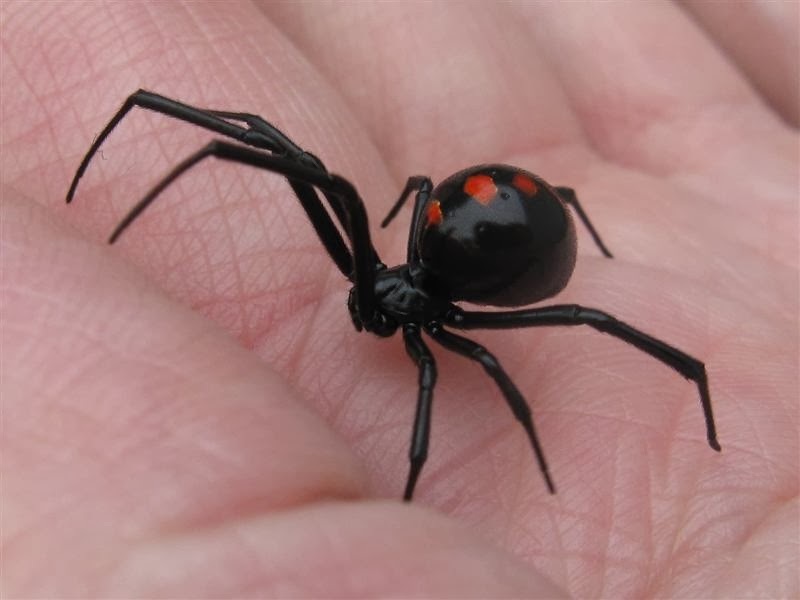 A quick 'googling' confirmed that juvenile female black widows have these red spots. THE MERIT of poisonous spiders - not a one that I can think of. 3. Ticks. See #2 above as to their relationship to off-grid living and their merits or lack there of. 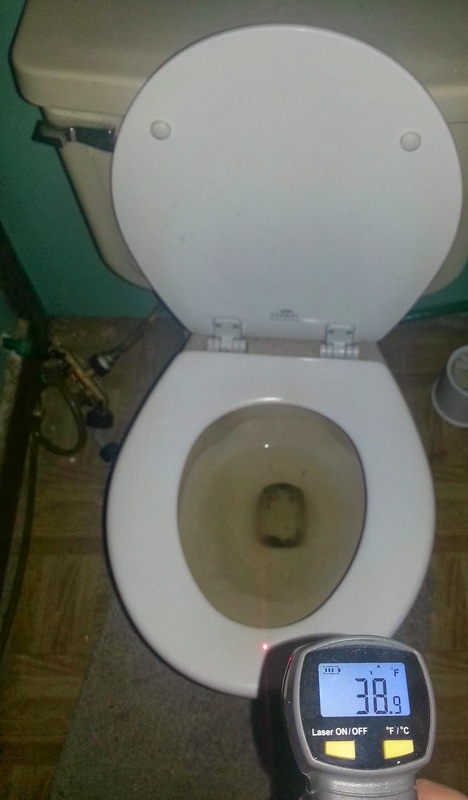 A 38 degree toilet seat! Going back to carrying water to the bathroom for flushing the toilet and taking showers as the hose from our gravity feed tank outside is frozen. Making sure we wake up every two hours or so at night to add wood to the fire. Normally we keep the bedroom door open at night so that the heat from the main area of the house also heats the bedroom, but on the below zero nights we slept in front of the fire in the living room and closed off the bedroom door so as not to try and heat the extra space. We also kept the bathroom door closed to corral all the heat in the main living area, but this led to some very cold situations when it was time to 'use the facilities.' You may recall in a very early post, I had inadvertently named our toilet 'Yipee!' Well, lets just say in this last cold spell Yippee was a bit nippy. Power outages - our batteries will last through several overcast days and if need be, we can supplement the sun by charging them with our emergency generator or bicycle generator. Loss of heat due to power outages - our wood burner requires no electricity and even though some rooms may be a bit chilly, we are quite comfortable snuggling up by the fire. During the very frigid temperatures I found out some of our friends were having a hard time keeping their house any warmer than about 66 degrees because houses are not winterized down here like they are up North. Not being able to get out to the store due to icy roads - with all the canning I have been doing, based on the fact that we do not depend on a freezer, we always have a supply of ready made meals and meats and my sourdough starter provides comfort foods like sourdough pancakes for a filling breakfast. We also have a supply of shelf stable milk so there is no need for that storm induced necessity of stocking up on bread and milk that permeates our society at the sight of the first falling snowflake. Oh, and one more MERIT to the extra cold weather this winter - It will hopefully wreak havoc on the tick and spider population next summer!